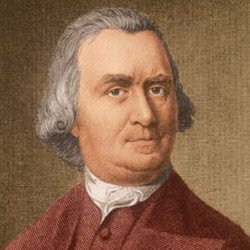 Samuel Adams was a Massachusetts businessman, writer and political figure, known for his busy activism and his radical political views. From the mid-1760s, Adams became the American Revolution’s agitator in chief, to the extent that the British reportedly declared him the “most dangerous man in America”. 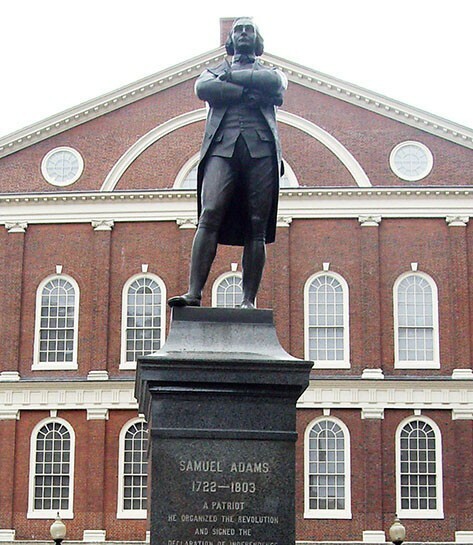 Adams was born in Boston in 1722. 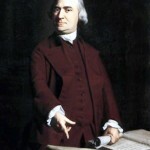 His father, also Samuel Adams, was an affluent Bostonian merchant, a devout Puritan church leader and a legislator in the Massachusetts assembly. The Adamses enrolled 14-year-old Samuel to study theology at Harvard, laying the ground for a religious career. Samuel Junior found stronger interests in law and politics so abandoned plans to enter the church, though he remained devoutly religious. During his Harvard years, Adams’ father’s investments in a ‘land bank’ and paper currency releases were ruined by shifts in British policy. The family lost most of their assets and were driven to the brink of bankruptcy; claims on their property would continue for the next 20 years. As a consequence, Samuel Adams had personal experience of arbitrary British policies and personal reason to hate them. Adams graduated from Harvard in 1743. He made several unsuccessful attempts to establish a business, however he was not good with money and most of his ventures failed. On one occasion he loaned half his capital to a friend, who never repaid it. Adams ended up running the family’s malthouse, producing malt for brewing beer (he is often mistakenly referred to as a brewer). By his mid-20s, Adams was active as a journalist, writing and publishing an independent newspaper containing political essays and polemics. One of his particular concerns were infringements on local rights, such as incidents of impressment (working men being forced into service in the Royal Navy). Adams was sharply critical of local elites, who he considered too closely aligned with Britain. In 1757 Adams accepted a position collecting taxes from the citizens of Boston – but his own experiences made Adams a lenient tax collector and many debts went uncollected. By the mid-1760s Adams’ negligence had left the city more than £8,000 in arrears – though as a tax collector who collected few taxes he was popular with the public. Adams’ interest in political matters peaked with the 1760 appointment of a new governor, Francis Bernard, and the actions of the lieutenant governor, Thomas Hutchinson. Adams loathed Hutchinson, a member of the Loyalist aristocracy and indirectly involved in the policy that almost bankrupted Adams Senior. Adams involved himself in political discussions and meetings. He was invited to join Boston’s influential Caucus Club, a clique of business owners and tradesmen who worked behind the scenes to control town meetings and influence political appointments. 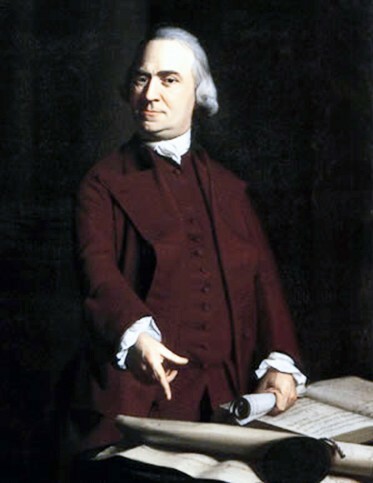 In 1764 Adams vigorously opposed both the Sugar Act and a proposed stamp tax, arguing against them on both economic grounds (that they would have a dire impact on Massachusetts’ economy) and constitutional grounds (that the British parliament had no constitutional right to pass either policy). Adams’ speeches and articles improved his public standing and his influence within the Caucus Club. In 1765 Adams was elected to the Massachusetts colonial assembly. Adams’ tenure as a colonial politician was unusual because of his grassroots connections with ordinary Bostonians. While his fellow legislators were not greatly interested in public support, Adams cultivated it and sometimes exploited it. He was a clever political organiser, later described by one historian as “America’s first professional politician”. Adams maintained his criticisms of British revenue policies, expressing doubts about their constitutionality. In 1765 Adams, being a skilled writer, was called on by the Massachusetts assembly to draft resolutions responding to the Stamp Act. His radical draft condemned the British policy and asserted the natural rights of the colonies. In late 1767 Adams suggested a boycott of British imports as a protest measure against the Townshend revenue legislation. Adams was not yet in favour of independence, at least not publicly; his cousin John Adams noted that Samuel was “always for softness and delicacy, and prudence where they will do”. Adams’ radicalism was peaked by events in 1768. In February he drafted a circular letter on behalf of the Massachusetts assembly. This letter declared the Townshend-sponsored Revenue Act to be both unconstitutional and unacceptable because it had not been passed by colonial representatives. Infuriated by this challenge to its authority, Westminster ordered the Massachusetts legislature to withdraw the letter from circulation. When it refused, governor Francis Bernard dissolved the assembly and London increased troop numbers in Massachusetts. For Adams and his radical cohort, this was an unacceptable trespass on their liberties. A series of anonymous articles, most of them almost certainly penned by Adams, began to appear in New York newspapers under the umbrella title “A Journal of Occurrences”. They were lurid or seedy tales involving soldiers in Boston – from drunken Redcoats urinating in the streets to vicious assaults on innocent Bostonians, even sexual assaults on local women. Most of these accounts were either wildly exaggerated or based on rumour more than fact, however, they had the desired effect. The Boston Massacre (March 1770) seemed to validate some of Adams’ foreboding about the presence of British troops. By mid-1770, parliament had repealed the Townshend measures, bar the duty on tea. Anglo-American relations eased and many of the more radical voices of the 1760s – like James Otis, John Hancock and John Adams – had become less vocal. This was not the case with Samuel Adams, who continued to resist British impositions in America. In 1772 Adams organised committees of correspondence, formed to protest a British proposal that governors and royal officials be paid by London rather than the colonial assemblies. He maintained his attacks on Thomas Hutchinson, by now the acting governor. 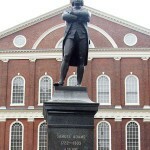 In mid-1773 Adams unveiled a brace of Hutchinson’s private mail – including one note that suggested London should consider withdrawing some of the liberties enjoyed by the people and politicians of Massachusetts. Lastly, Adams railed against the Tea Act and its triple purpose: to flood the colonies with surplus British tea, to shut out American tea merchants, and to gather revenue in the form of tea duty. Adams whipped up opposition to the Tea Act and organised a blockade to prevent British tea from being unloaded in Boston. He spoke heatedly at the public meeting which preceded the Boston Tea Party. His level of involvement in the Tea Party is not clear, however, he certainly supported it after the fact. S. Thompson & J. Llewellyn, “Samuel Adams”, Alpha History, accessed [today’s date], https://alphahistory.com/americanrevolution/samuel-adams/.